Such a fun, easy and delicious small bite dessert for the summer. 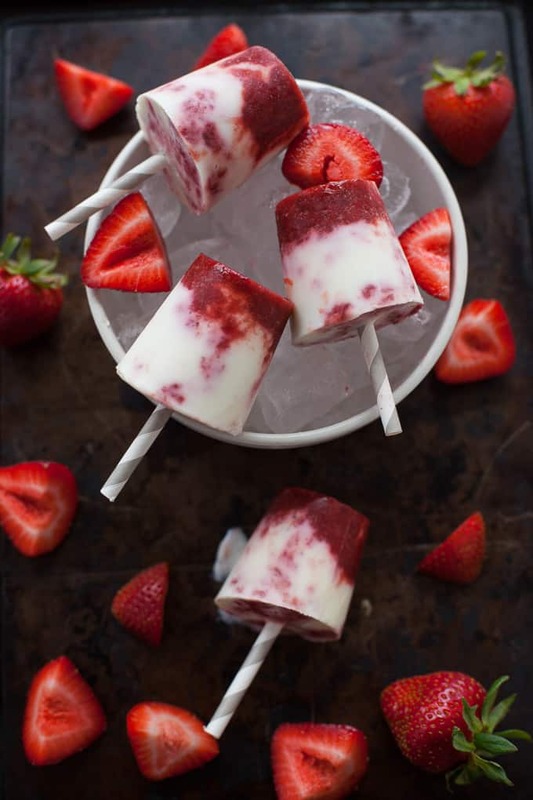 These mini balsamic strawberry and cream popsicles are the perfect sweet treat for your next summer gathering! Six years ago I joined a little blogging community under a different blog name (RIP Peace, Love and Food). I tried my hand at making recipes and posted pictures like this gem. 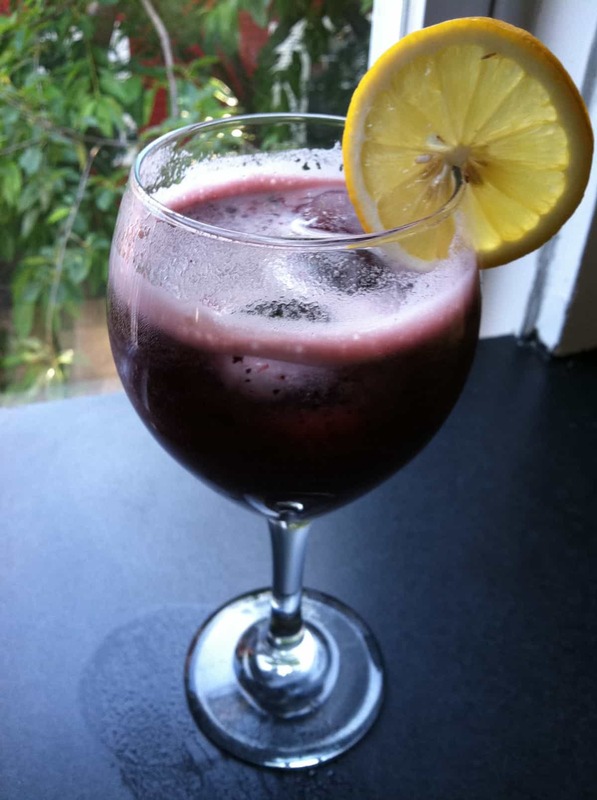 Yes, this was my very first Redux recipe – Blueberry Basil Lemonade Fizz! It’s so crazy to me that Recipe Redux is turning six this month (and that I’ve been blogging for seven years now)! It’s been awesome to watch this blogging community blossom and grow and to be a part of it every (well, mostly every) month. 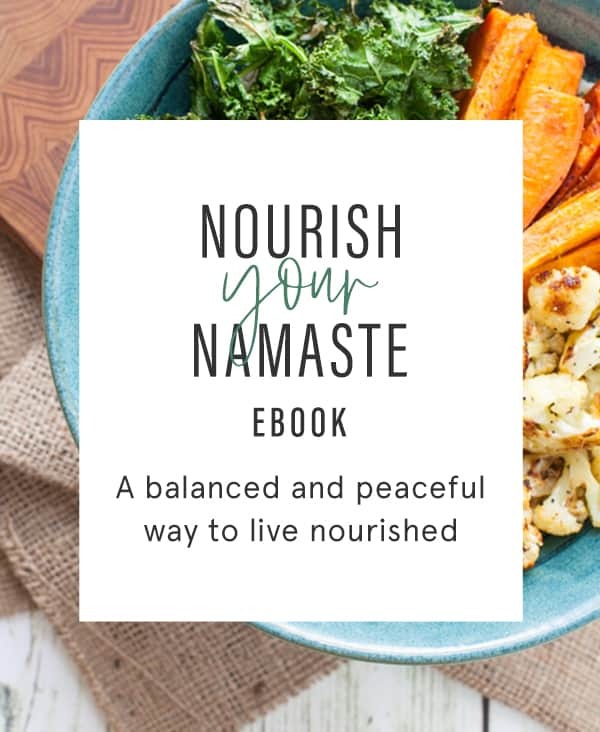 I love the challenge of figuring out a new recipe that will fit the monthly theme and connecting with other bloggers who post their recipes on the same day each month. When you’re a blogger, your work can feel a little lonely at times. You’re staring at your computer like hellooooo anyone out thereeeee? 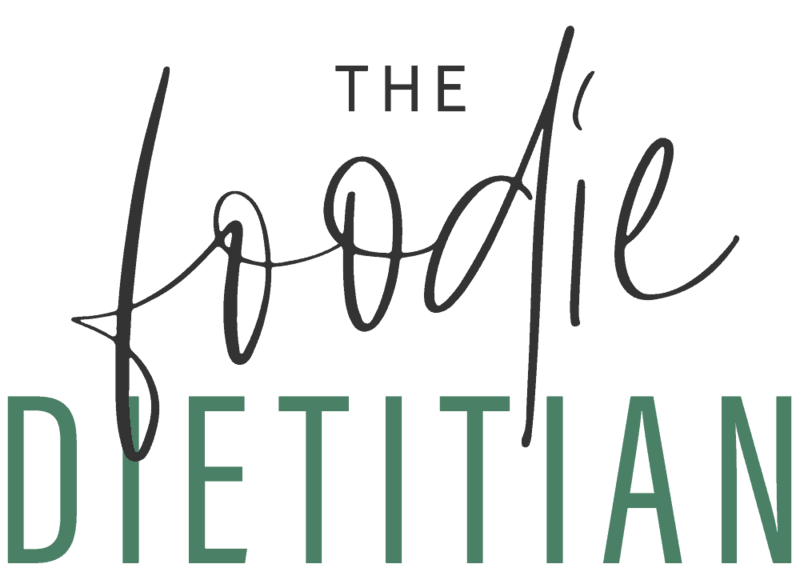 And it’s these communities and rockstar dietitians like Regan, Deanna and Serena who founded Recipe Redux that make the blogging world seem a little smaller and a little less lonely. 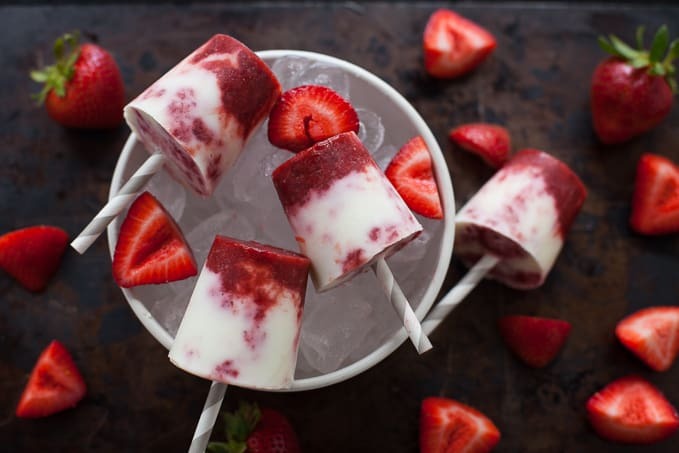 So this month I’m celebrating Recipe Redux’s sixth birthday with a small bite dessert: these adorable mini balsamic strawberry and cream popsicles! I love roasting strawberries in balsamic vinegar. You might remember that from my balsamic roasted strawberry shortcake I posted a few years back. I know it sounds a little weird – vinegar on strawberries, in dessert?! But trust me, it’s amazing. The vinegar actually helps to elevate the sweetness of the strawberries. These popsicles are super easy to make. Roasted strawberries. Kefir. Done. See, wasn’t that easy? You can totally make these in regular popsicle molds but if you want to be all cutesy and make mini pops, you can use Dixie bath cups as the mold. And then I cut these decorative straws in half for the sticks. But you can use a regular popsicle stick – whatever you have on hand will do. You can be sure everyone will love these pops, even the kiddos. My husband, who is a kid at heart, DIED over these. I mean he’s a popsicle guy anyways but I kid you not he asked three different times what I put in these popsicles, as if I would finally divulge some secret delicious ingredient to him. He couldn’t believe they were just strawberries and kefir (and balsamic vinegar and maple syrup). You probably won’t believe it either. 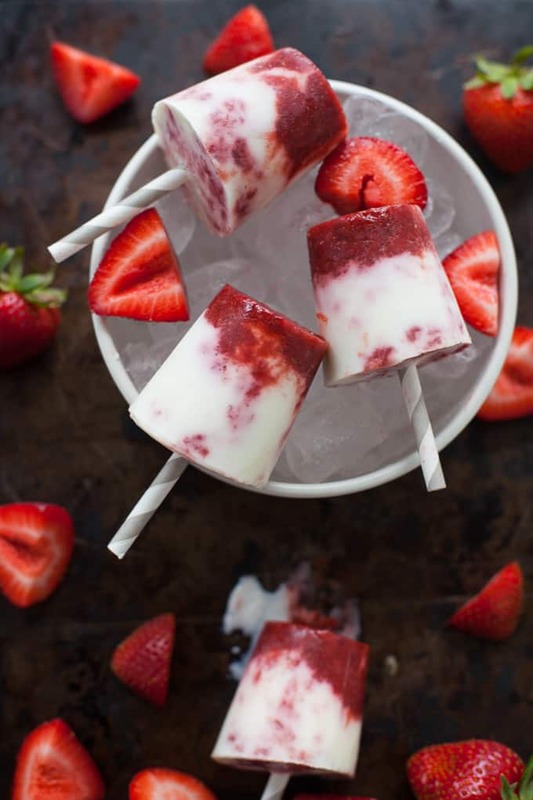 Enjoy these mini popsicles at your next summer BBQ. These would be totally cute for a 4th of July party too – throw some blueberries in there and you’ve got your red, white and blue! I hope you all have a great weekend! I’m just getting back from a work meeting in Quebec City and Steve will be in NYC this weekend so I’m hoping to kick back and relax a little. 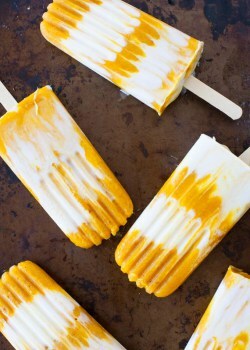 And eat a few of these popsicles ;). Place strawberries onto baking sheet and toss with balsamic vinegar and 1 tablespoon maple syrup. Roast in oven for 30-35 minutes or until tender, turning over every 10-15 minutes. Let cool to room temperature. In a small bowl mix kefir with remaining maple syrup. Add cooled strawberries to a blender and blend to a thick puree. Line up dixie cups on baking sheet. 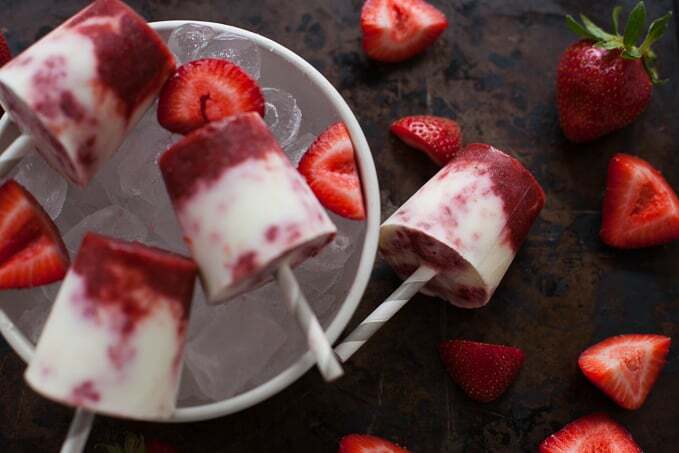 For a marbled look, layer strawberries and kefir in each dixie cup. Use a straw to gently swirl the layers together. Push straw about 3/4 way into cup. Place the cups on the tray into the freezer and freeze for at least 4-6 hours. 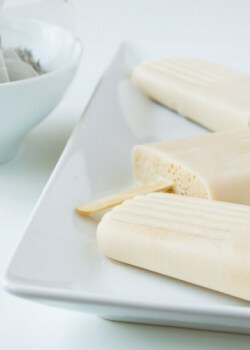 Before serving, remove from freezer and gently peel back paper cup from popsicle. Tell me, do you have a go-to popsicle recipe? Have you tried strawberries roasted in balsamic vinegar? 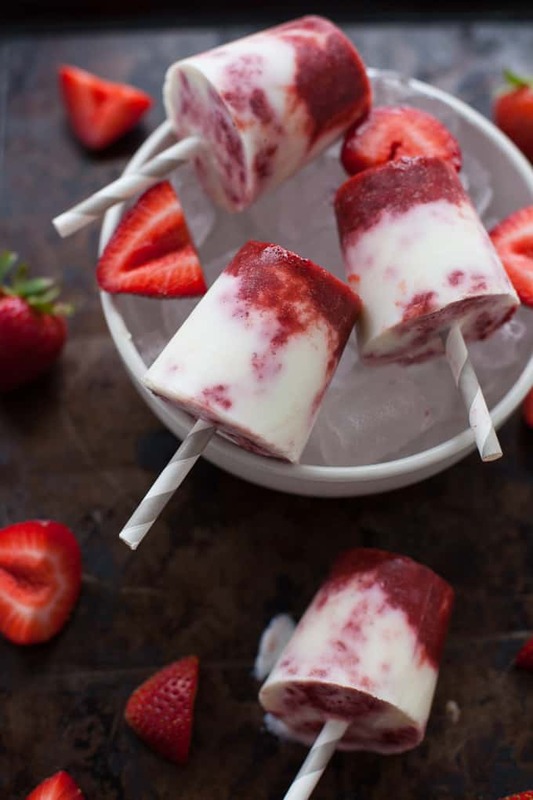 Looking for more popsicle inspiration? Try one of my recipes below! These are so pretty and sound delicious!! 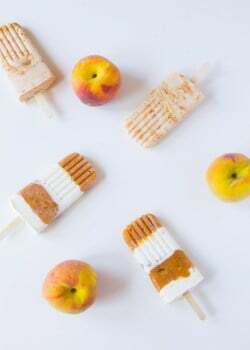 We’re hosting a BBQ for my husband’s new work and these would be so perfect for dessert – I may even try adding in some peaches as well. Yesss! Peaches would be a delicious addition! These are gorgeous!! 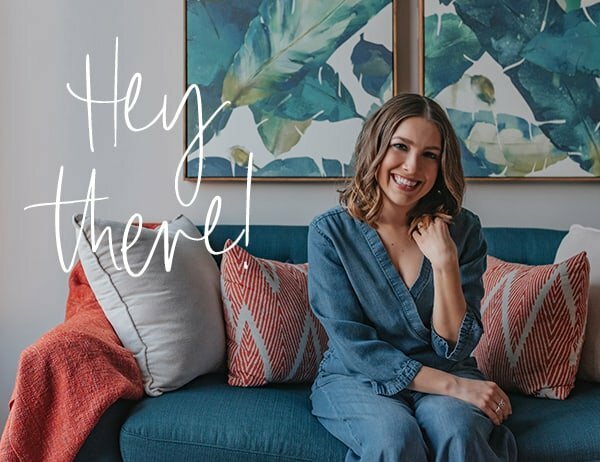 I love having the Recipe Redux community – it definitely makes blogging a lot less scary! And to see how far your food photography has come… I always look back at my old photos and cringe, but it’s also such an amazing feeling to see how far I’ve come as a self-taught food photographer! I can totally relate, Chelsey!! It is such an awesome feeling. Thanks for this recipe! But please just let me know: why mine are quite icy? I can feel all the ice crystals in them? What went wrong? Is it normal? You’re welcome, Sofia! I would say in general popsicles are meant to have somewhat of an icy texture to them. I would say it’s normal but it’s hard for me to know without being able to taste yours and compare them to mine. Did you use the Dixie cups? Perhaps try them again with regular popsicle molds and see if that makes a difference at all? These sound so sophisticated and fancy! Kefir is a great ingredient! So much to say…. First THANKS for the kind words about ReDux! You’ve been here since the very beginning…thank YOU to you. What fun it’s been to watch your blog totally blossom and get famous! Now, about this post…how brilliant it is to use kefir in popsicles – so much easier than making yogurt pour-able! Roasted strawberries…I need to do that. And blueberries for the 4th with strawberries…I’m on it. What a great idea. Pinning! Thank you so much for your kind words, Serena! I hope you enjoy these sweet summer treats! Love balsamic roasted strawberries! Need to make these – my girls have been super into kefir lately!